Feline pancreatitis is often part of a larger inflammatory disease process that may also involve the liver, intestine, and kidney. Clinical signs are often vague and non-specific, and include lethargy, dehydration, weight loss, loss of appetite, increased heart rate, increased respiration rate, and jaundice. A small percentage of cats will show vomiting and abdominal pain. 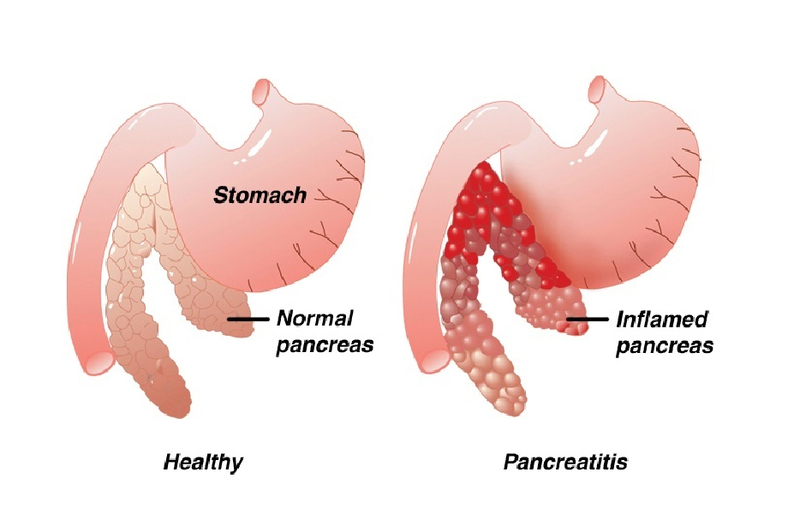 What routine tests are available to diagnose pancreatitis? Are they specific? Routine blood tests such as the Complete Blood Count and Biochemistry Profile usually reveal a variety of changes, but none of them is specific for pancreatitis and most indicate involvement of other organ systems. Two enzymes found in the blood, called serum amylase and serum lipase, that have a small role in the diagnosis of canine pancreatitis, are not useful at all in diagnosing pancreatitis in the cat. Pancreas-specific Lipase is a form of lipase produced only in the pancreas. It is highly specific to the pancreas and blood values increase only when there is pancreatic inflammation. How is pancreas-specific lipase measured? What sample is required? Pancreas-specific lipase is measured with a test called Feline Pancreatic Lipase Immunoreactivity, known simply as fPLI. The test requires only a small blood sample. A fasting sample is recommended. Does the sample have to be sent away to a diagnostic laboratory? Yes. Currently, the feline test is only available at the Gastrointestinal Laboratory at Texas A&M University. It may take several days to get results back from the laboratory due to the distances involved, depending on where you live. A more readily accessible version of the test may be available in the near future. How reliable a test is fPLI? Studies have demonstrated that fPLI is both sensitive and specific, which means the test is correctly able to diagnose pancreatic inflammation when it is present, and that fPLI is elevated only if pancreatic inflammation is present. The long turnaround associated with fPLI may limit its usefulness in diagnosing acutely ill cats, but the test remains an important tool for detecting and monitoring feline pancreatitis, especially in chronic cases.